LONDON (Reuters) – Ole Gunnar Solskjaer’s return to Manchester United has rejuvenated the club’s spirit on and off the pitch, but the Norwegian says only winning games can keep him smiling. Solskjaer came through his toughest managerial test yet with flying colours as his side beat Tottenham Hotspur 1-0 in the Premier League at Wembley on Sunday thanks to a Marcus Rashford strike and superb goalkeeping from David De Gea. “I think he’s the best in the world, obviously there’s a few other decent ones out there, but I’m very, very happy that he’s in my team,” Solskjaer told reporters of his Spanish goalkeeper. 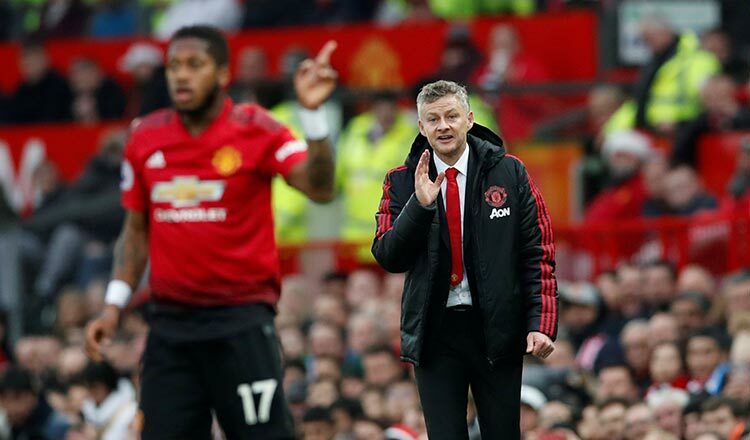 De Gea has said the new caretaker boss, who replaced the sacked Jose Mourinho last month, has brought happiness back to the club, but Solskjaer believes the improved mood is very much down to what the team does on the pitch. “I don’t think anyone would be happy if we didn’t win games. It’s about winning games, but you have to realise when you’re at Man United, you have to put a smile on your face,” the 45-year-old said. “You have to go into work every day enjoying it, because one day, suddenly, it’s over and you look back and say ‘Oh, that was a great time’. Pictures from United’s warm-weather break in Dubai last week showed a relaxed group of players enjoying each other’s company after a tense and turbulent start to the season under the surly Mourinho. The win over Spurs was the sixth in a row since the more laid-back Solskjaer took over, and they are now sixth in the table on 41 points, behind Arsenal on goal difference and six points adrift of fourth-placed Chelsea. Solskjaer was nicknamed “the baby-faced assassin” in his United playing days as a prolific striker under manager Alex Ferguson when they dominated English football. “We’re not where we should be. Man United should never only look for the top four, so of course we have a job to catch up to the teams in front of us,” he said. “We’ve got some games coming up now that we’re expected to win maybe, where we’re at home, so let’s just concentrate on the next performance and keep working as we do in training,” he said.